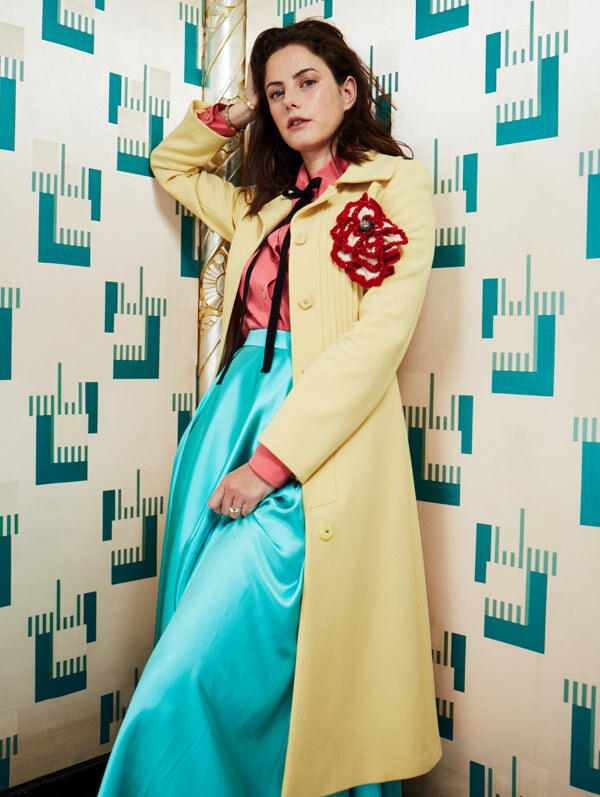 While her looks are certainly never a driving factor for Scodelario, clothes have played a part in shaping her most lauded character, Effy Stonem of Skins. It is hard not to reminisce about her careening entrance in season two of the British drama, with her fishnet tights, lace-up boots, and kohl-rimmed eyes surmising her swagger into the hearts of teens everywhere. With her ripped-up, reworked, and altogether rowdy ensembles, her dress came to denote her wild antics, identity, and attitude. While it was a guise, a character she embodied for the show, off-screen Scodelario holds a certain effortlessness in her attire, citing Kate Moss as a style icon. Much like the grande dame of London fashion, Scodelario is as relaxed in tee and trainers as she was in an impeccable pink mid-length frock and a swept-up chignon at Chanel’s Paris Fashion Week showcase. As she sits with us at lunch, a rose gold Cartier Love bracelet twinkles on her wrist. With the original design created in 1969, the affectionate name and elegant finish is well noted: I can’t help but feel the woman in front of me has grown into herself—her own skin—after more than a decade in the global spotlight. Yellow coat; pink shirt with tie; flower brooch; and green silk skirt, all from Gucci. Jewellery (worn throughout), Kaya’s own. We are here to talk about her life as she knows it, and the path her life is on. With her raven hair tucked behind her ears, she laughs with an honest gush, and answers effusively to all posed questions. Scodelario is extremely verbal about her working class background, proud of her roots and of her Brazilian mother who raised her on her own. While school was difficult due to her dyslexia, Kaya was keen on drama, and revelled in the school plays. When her teacher received an e-mail about the upcoming audition for a new teenage TV show, Scodelario went along. She auditioned for Skins, lying about her age and claiming to be older than 14, only to be told they were looking for someone younger. “They wanted to get real teenagers because they wanted that energy of kids that were actually going through these things,” Scodelario divulges. “There is something so raw about your teenage years. It is scientifically proven that you do go a bit nuts during your teens, so when you feel things, such as falling in love for the first time, it really is that dramatic. They really wanted to get that emotion out of us and didn’t want actors that were trained.” By hiring the cast through an open call, the TV producers dished up hearty dinners of realness with characters still discussed about, 10 years on. White brocade dress, Erdem. Vintage yellow earrings, Gillian Horsup at Grays Antiques. Scodelario still seems struck by disbelief for where she is today. The word “fortunate” returns time and again, a woman humbled by the unique turns her life has taken, as well as the serendipitous sequence of events. At one point, she laughs and says she is fearful one day someone will catch her out, and send her far away from the dream she’s been living. And what a dream it has been. In 2013, the actress starred in Luca Guadagnino’s Walking Stories romantic comedy for Salvatore Ferragamo, before gracing the front rows of London and Paris Fashion Weeks—the latest being Chanel’s Cruise ’18 show in Paris. As a woman, an actor, a mother, and a Londoner, Scodelario is exactly what you see on the tin—a straight shooter with integrity, grit, talent, and a beautiful spirit. “When I was a kid, I thought actors had to be perfect,” she laments. “They couldn’t have any faults, they had to be role models. Now, there are more open female voices, and people realise that we are normal. We do eat chips, swear, and mess up!” The ordinary is where she finds the extraordinary, be it taking her baby on the London Tube or gracing the cameras in a Loewe gown—Scodelario in a nutshell.